I am very excited to be working on a new house project for a couple who lost their house in the recent Fourmile Canyon fire just west of Boulder. I feel deeply for their loss – years of mementos, photos, etc. all lost, not to mention the house itself, the repository of years of memories and events. So it is kind of odd for me to be happy working on a project that stems, to some extent, from a great sadness. But I can’t help it, I love to make buildings, to sit down with folks, listen to their stories, their dreams and thoughts and try to give form to those explicit and implicit desires. 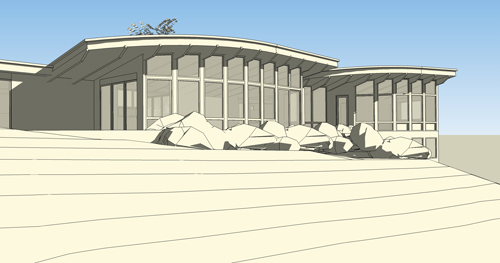 These are some relatively early views of SketchUp model of the project. SketchUp is a great tool and its integration with Google Earth allows us to upload the model and place it in the actual topography and verify view corridors to specific sites – in this case, a distant view east to Denver and extensive views west and south to the mountains. While I would probably never give up the tools of physical models, sketches, plans, etc., the use of SketchUp is a powerful tool that might tempt one away from such traditional design methods. 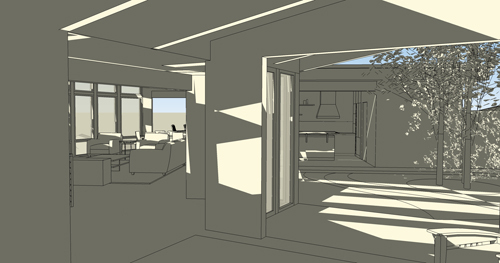 It can in fact be a bit difficult to remember that even though we can make a fully rendered model of the project that we can walk through, view furniture and the light streaming in, that we have not completed the design of the project. We may have crafted the space and maybe even captured some of the touch and feel of the building, but we hardly even touched the larger and more difficult task of detailing the structure. Every eave, every handrail, every window mutin has yet to be drawn and studied. As my friend David Leary says, it’s a marathon, not a sprint. On Thursday, September 30th, Boulder County government held another update meeting for homeowners and the design and construction community on the status of potential regulations for rebuilding efforts after the Fourmile fire. The new regulations regarding building permits, site plan review, septic systems and waste disposal were discussed. Most of the meeting was consumed with discussions and complaints about the State of Colorado’s recent clarifications to waste disposal regulations for potentially asbestos containing material. Materials must be wetted to minimize dust; packaged inside a double 6-mil plastic sheeting liner in an end-dump roll-off with the sheeting completely closed over the material once the roll-off is loaded. The roll-off can only be taken to designated landfills. The landfill must be contacted prior to moving the material to confirm waste acceptance and initiate waste profile. Contractors should consult OSHA regulations to determine required training and personal protective equipment that will be required for those handling this material. These regulations have only recently (within the last week) issued and have come as quite a surprise to homeowners, contractors and the County. Some folks have already begun filling up roll-offs that may have to be off-loaded and reloaded under the new restrictions. The number of loads will be significantly increased, greatly adding to the cost of cleanup. This is an especially egregious regulation for structures built after 1984 when asbestos was no longer used in building materials. In addition, metals can be recycled, but must first be “rinsed”. I am not sure at this time if this water would then have to be treated or not. Foundation removal will require a State demoliton permit. Deconstruction will not be required although strongly encouraged. No Boulder County permits or fees are required for cleanup. For rebuilding in the same basic location, at the same size and height, no Site Plan Review will be required for 2 years, extending the current regulation from 6 months. For rebuilding in the same location but adding up to 10% of the existing building area, there will be a 2 week streamlined review process. For rebuilding in a significantly different location or of larger size or height, the normal Site Plan Review process will be required. The 2009 IRC code will come into effect in January and will be the acting code at that time. All rebuilds will have to meet building codes. Sprinklers will be required for any structures larger than 3,600 square feet and this provision may change with the adoption of the new codes. TDCs (Transferable Development Credits) will be available for properties rebuilding under the size threshold. The County’s BuildSmart program will apply to all rebuilds, although there may be some modification for properties requiring renewables because of a building area trigger. These planning provisions are not final. A draft of the provisions listed above will be issued next week, presented to Planning Board on October 2oth and the County Commissioners on the 21st. These are public meetings and you should attend if you would like to be heard. In the aftermath of the recent fire, a new landscape has been formed. The formerly isolated houses in Sunshine and Fourmile canyons, nestled in thick stands of pines and occasional aspens, have been opened up to wide-open vistas and uninterrupted panoramas due to the staggering loss of trees. From a single house site you can see across valleys and draws to distant hillsides and see houses, some standing, some not, that were never before visible. These views of other houses have become if not the dominant then at least very significant, new landscape feature. So, along with the sense of community that was forged in the tragedy of the fire, there is a new visible community apparent like never before. To that question, there are a number of people that are proposing an online community mapping project. Using Google Earth as a platform, the idea is to build 3D computer models of new and existing houses as they progress in the rebuilding project. Along with the buildings will come the knowledge, publicly accessible, of what is being done, who is rebuilding and when. This is an attempt to fill in the gap of the unknown, of the uncertain prospect, of living again in that beautiful but scarred landscape. Community mapping projects take many forms, from economic resources to educational opportunities. This map will attempt to record the past – in models of houses pre-fire, and the present and future – in models, geo-located within Google Earth, of houses proposed and under construction. The map’s beginning will be simple. The first stage is to add some information like property boundaries and driveway access to layers on the existing Google Earth topography. The next step is outreach – to encourage homeowners, of houses existing and proposed, to include their building information on the map. This can take the form of a precise SketchUp model uploaded to Google Earth as created by their architect, or a simple marker indicating some intention of rebuilding or not. This basic information will allow any homeowner, along with the local fire department and sheriff’s office, to identify what is being done in what location. A homeowner will be able to “stand” in the location of their new or proposed house and look out over the landscape and survey who else is rebuilding and where. Architect’s will be able to use the model to craft designs that can respect the views and forms of other houses and possibly to pool resources during construction. The local emergency responders will be able to look at the entire model and know if there is any longer a building at the end of that driveway and the location of new access roads. Potential layers are endless and can be added over time. GIS information indicating plant species, steep slopes, soils types, solar access and other layers can be included and will greatly help everyone in the rebuilding process. Key to this process is the participation of as many homeowners, architects and builders as possible. Inevitably questions of privacy arise and I think a simple and frank discussion can ally those fears. Certainly the advantages of this information I think will surpass the possible negatives. I want to strongly encourage everyone’s participation and I would be happy to sit down with any homeowner, architect or builder to explain the process and power that this map can convey. A map ties information to location. It is a tool for information and visualization. But most importantly this kind of map is a constituent of community. It will give everyone an idea of what has been and what is to come. By including information pre- and post-fire it links information to location to time, history and future. Please feel free to contact any of us listed above if you have any questions or suggestions. 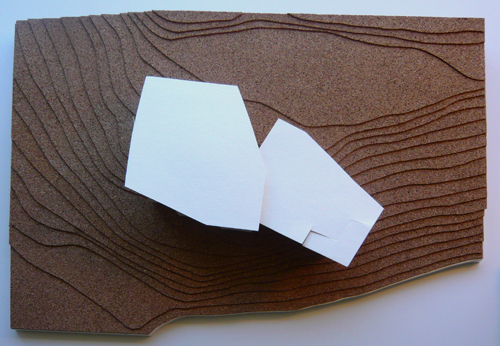 We hope to have a website up and running soon and this will include the first of the models located on the landscape. We will need lots of help to build as much of the existing area as possible – all of the Gold Hill buildings, existing houses, etc. – and we will have a quick workshop about how to quickly build models and to solicit help and advice. Many thanks to the good folks at Boulder’s own Concept3D, the leader in the field of database rich 3D mapping technology and Google SketchUp for providing technical assistance and advice. check out the website, 4milemap, and you will be able to see current projects as well as some posts on rebuilding advice and stages in the ongoing community mapping project. Last night was the first of three Rebuild Forums held in Boulder to assist property owners who are considering rebuilding after the recent Fourmile Fire. The event was held in the East Boulder Senior Center and consisted of a series of presentations as well as informational/marketing tables staffed by local builders and architects. Sponsored by BGBG, the 15 St. Desgin District and AIA North, the event was well-attended, if though most of the attendees appeared to be local tradespeople rather than homeowners. The following is a list of the presentations that were scheduled for last night. Fire-Wise Landscaping and Revegetation Carol Adams, Studio Terra, Inc. I will be there Sunday at 1pm with portfolio in hand to answer any questions and describe our experiences so far with working with rebuilding homeowners. I will not be giving a presentation, much to everyone’s relief. Can my old septic system be re-used? Do I have to go through the full Site Plan Review process if I am only going to add a few hundred square feet? Or move the house a bit? Can I put a temporary building on my site to live in while I rebuild? Will the County’s Transferable Development Credits program include fire-damaged sites? Will the County inspect current road access issues to determine their conformance with current code? Will there be significant changes to either the Wildfire Mitigation or Ignition Resistant Construction regulations? We would like to offer to design/redesign the lost home of emergency responders for free. Many of the architects I have spoken to have already expressed interest in this and we hope it can be of some help. The County has waived Site Plan Review requirements, so this is a fairly straight-forward design and document process that we think will result in a higher quality of both design and construction for these heroic firefighters. I still have to line up consultants who are willing to donate their time but I believe this will be forthcoming. I will release a list of participating architects and consultants soon. 1. Modular construction – you are all probably familiar with this and you may be likewise acquainted with my criticisms of this process. 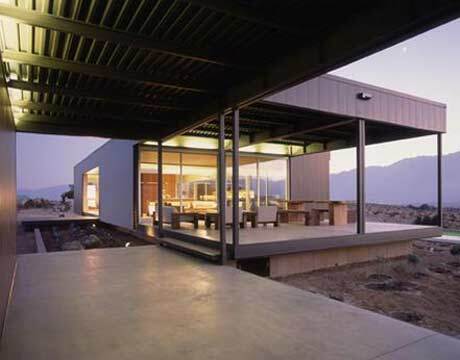 Basically this is a semi-custom design and construction process where the building is subdivided into a number of trailer-sized components, built in a factory, and shipped and then assembled on site. My chief objection to this process has to do with the exporting of labor – the factories displace the work of local carpenters, framers, and other tradespeople. As the construction economy has been so terribly lately, I would not champion a method of construction that might make this situation worse. Not to mention that some of the people who lost houses are probably the same tradespeople that could use some work as well as a new house. 2. I think this method has a lot of promise. Panelization also breaks the building down into components, but does so at a much smaller scale – that of walls, not whole structural sections. These panels could be built down in Boulder or Longmont and this kind of construction could continue without the weather interruptions common to the mountainous sites for which they are intended. Key to the potential cost savings here is the development of a series of semi-standard panel sizes that can be configured to accommodate differing sites and maybe existing foundations. 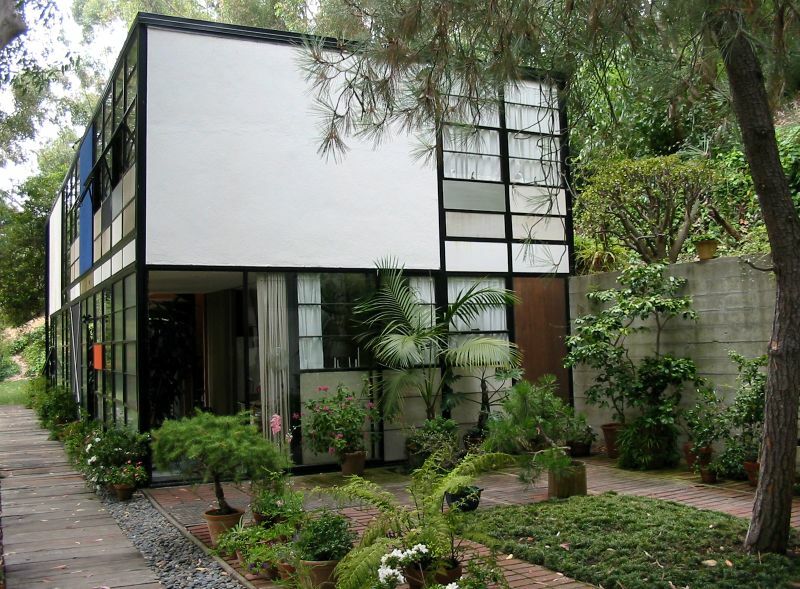 Eames House - a model for panelization? 3. Bulk purchasing of materials. There certainly is money to be saved in purchasing in quantity and pooling some efforts, even among different contractors, could be utilized to reduce construction costs. This would allow a great variety of designs and styles but some similar material expressions. You can see a great example of this in the Floral Park Historic District in Boulder. A one-block collection of houses built in the 1940’s was constructed using identical brick and similar window sizes and styles. These materials and components were purchased in bulk by the builder and not only saved the homeowners considerable money but also lend the neighbor a kind of theme-and-variation consistency that has only improved with time. I don’t know if any or all of these efforts will come to pass and there is serious talk about forming a non-profit of architects, builders, and engineers to help out. If you have other ideas or would like to be included, either primarily or by simple reference, please let me know. I think that simply doing nothing would be a bit of a disservice to the efforts of the emergency responders and pooling our efforts may help create a new community of homes in the mountains that can be energy efficient, thrifty, and beautiful.